There was a time when, if a bride wanted to walk up the aisle at the Old Stone Baptist Church, she had to hoist herself, gown and all, through one of the church’s back windows. Most churches place the pulpit and the main entrance at opposite ends of their building, allowing for formal processions up a center aisle. When it was built in 1752, however, the two entrances to the Old Stone Church stood behind the pulpit, making for an awkward and subdued entrance for the bride. The solution? A ladder, a window, and a congregation willing to keep their eyes averted while the bride fixed her dress. In the late 1950s, the church added an entrance hall opposite the pulpit. Brides at the Old Stone Church no longer climb through a window in order to make a grand entrance, but for many congregants, it’s a fond memory of one of the church’s more interesting customs. The Old Stone Church was also known for its annual Rhode Island clambake. The church held the first clambake in 1864, and by 1875, an astonishing 4,000 people attended the event. The clambake served as a fundraiser for the church, drawing people from neighboring communities regardless of religious affiliation. In the morning, cooks placed heaping mounds of Rhode Island clams and quahogs, along with locally-grown potatoes, onions, and corn, into a pit lined with a bed of hot rocks. The cooks alternated layers of food with moist rockweed, slowly steaming the feast for hours. 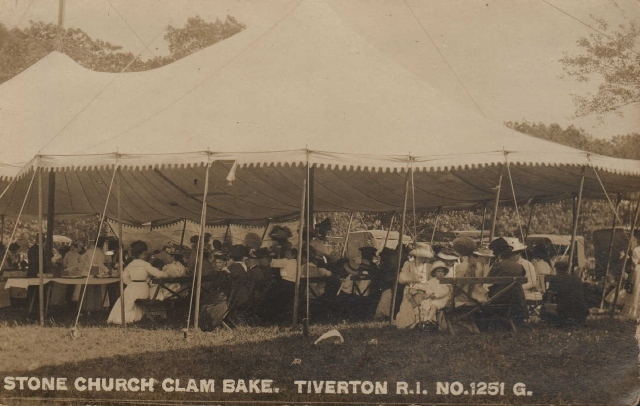 The Manchester family of Little Compton were for many years a critical part of the clambake: Abe managed the event, Debbie collected tickets, and Lizzie cooked the chowder. Crowds gathered southeast of the church behind the Pleasant View Cemetery and sat at long tables. The Old Stone Church clambake was always the social event of the season. People dressed in their finest clothes and munched on iced watermelon to cool off in the summer heat. Many local stores closed and gave employees the day off. The popular event halted during World War II due to rationing, but in recent years, the church has begun to revive the delicious tradition. 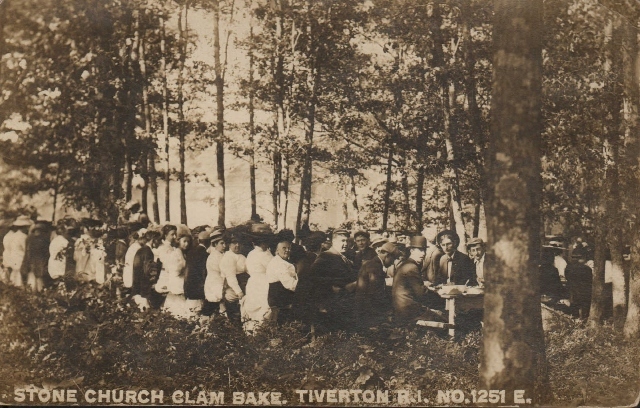 During the years that the clambakes weren't held, the church grounds became the site of an annual bazaar. Farmers bought and sold livestock, demonstrated crafts and skills, and held an antique auction on the church lawn. Reverend Bob Hollis remembers a toy table that Millie Waite arranged where a nickel would buy children the bag of their choice, with a surprise toy inside. The atmosphere was festive and exciting, with people spending days putting up booths and preparing for the festival. Even though the church isn’t technically in Adamsville—it’s just over the line in Tiverton—for Adamsville residents, it has played a long and important role in the religious and social life of the village. After all, if your congregation is willing to put up with climbing through a window to get married, it’s clearly something special. 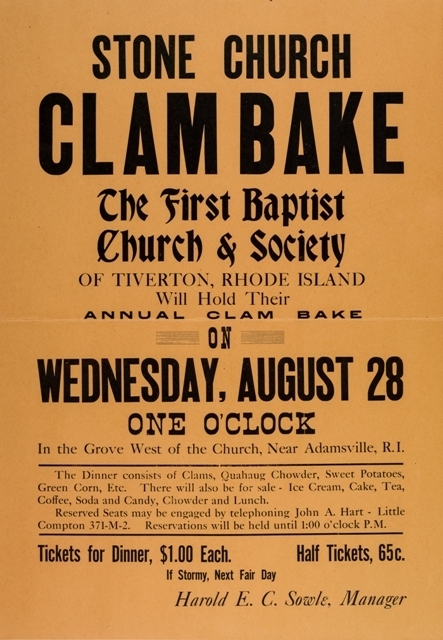 Old Stone Church Clambake Poster : This poster from the Old Stone Church clambake highlights the popularity of this annual tradition that brought together people from all of the surrounding communities of Adamsville, Tiverton, and Little Compton. 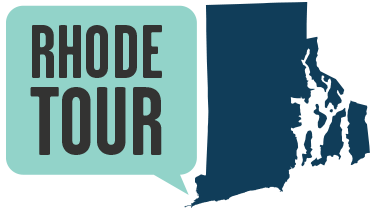 Abigail Ettelman, “Old Stone Baptist Church,” Rhode Tour, accessed April 22, 2019, http://rhodetour.org/items/show/100.